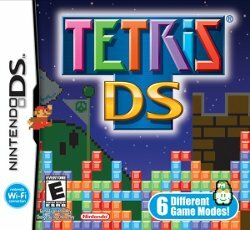 Tetris DS is a Nintendo DS video game developed and published by Nintendo. It supports up to ten players locally (with just one Nintendo DS game cartridge), or up to four players online with the Nintendo Wi-Fi Connection. The game features a wide variety of different Tetris modes, with Nintendo-themed music. Various remixes of the music from games such as Super Mario Bros., Super Mario Bros. 3, The Legend of Zelda, and Donkey Kong are present, among others. This page was last edited on 7 February 2017, at 02:02.